Over $168 million in sales for direct-to-consumer company in the hobbies niche. New control for dietary supplement. Over 1.5 million pieces mailed to date. 31% open rate for restaurant emails (10% above industry average). $1.5 million in monthly sales from a VSL for a $19 ebook with a 24% upsell conversion. Sales letter for roofing company: 4% closed sales. 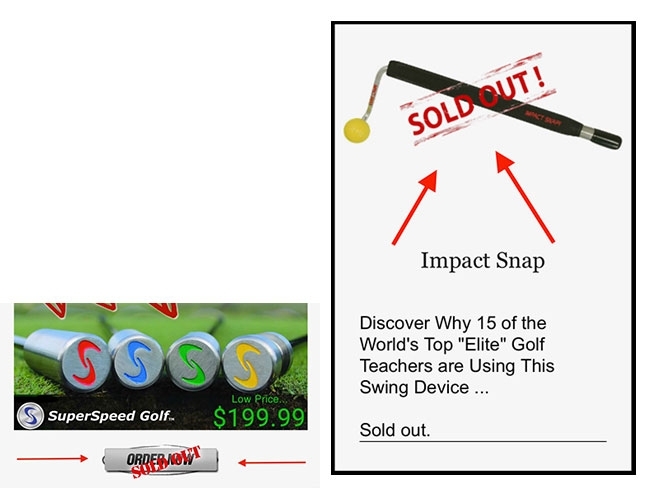 $1.6 million in sales for a $149 golf product. Online sales page for $129 info-marketing product: 3.5% conversion. Advertorial for nutrition company beat control by 32%. Over $400 million in revenue in 5 years. If you'd like to achieve the same results, contact me now for a free consultation. Click here or call 704-517-0241. My clients closely measure conversion and they keep sending me assignments. Meet a few of my clients. I also worked with Ryan Levesque on a customer acquisition funnel for a client in the sports space. This funnel has attracted over 2 million new customers for the client in 36 months. My name is Scott Martin. I'm a direct response copywriter with a proven track record turning readers into buyers. I provide the highest level of direct response copywriting to help my clients achieve their revenue goals. And, as a direct marketing specialist, I can also provide direct marketing tactics and strategy, specifically product positioning, product development, marketing strategy, plus a road map to take your company to the next level. When I'm writing, the most important goal is to persuade readers to take the next step in the sales process — to CONVERT the traffic you're generating into a client, customer, or highly qualified lead. Core Values and How I Work. I Am TOTALLY Devoted to Your Success. ONE. My goal is to help you sell your products and services. I’m NOT trying to earn applause from the “copy police” or to win advertising awards. I’m here to help you increase your sales. As such, I rarely write branding copy. TWO. Testing is my critic. How did the copy perform? Results? A single measurement is worth a million opinions. I base my work on what’s worked … based on actual results. If I get beaten up … and it happens … I get up, dust myself off, and try again. THREE. I sell with integrity. I will place your product or service in the best possible light … but I will not lie or work for black-hatted scallywags. There is no need to make stuff up in copy. FOUR. I believe in the prosperity and success of my clients … and your potential to achieve your goals with the help of direct marketing and direct response copywriting. I can write direct response copy plus copy for the corporate environment. My clients include companies, agencies, and small businesses from London to Los Angeles and from Brisbane to Borneo. I'm constantly learning and striving to improve my copy. To achieve this and increase your revenue I have taken copywriting instruction from David Deutsch, Herschell Gordon Lewis, and Parris Lampropoulos. I'm also a member of the Titans Mastermind group run by Brian Kurtz who ran Boardroom's marketing for 30 years. When I look at the most important traits that have been evident with every great copywriter I have ever met and worked with, the two which are most critical to be present in all they do are "curiosity" and "passion." Scott Martin has both of these key components in abundance ... and they show up all the time when he dives deep for any client he has ever worked with. And as a key member of my mastermind group for top level direct response marketers, copywriters, and entrepreneurs, his curiosity and passion are always on display through the questions he asks ... and the advice he gives based on his experience working with many of the world's top direct marketing companies. Want proof my copy works? Look above at the results my clients enjoy, including an actual email I received from a client. Companies that live and breathe direct response. Information marketers (financial, health, golf, and biz-op). Advertising and marketing agencies who need direct response copy. "Micro" and small businesses owners who have discovered direct marketing and want to hire a direct response copywriter to generate more leads and more revenue. Call me at (704) 517-0241 or click here now for a quote. I’m excited to help you ramp up conversion and increase your revenue. 1. Proven record providing copy that converts. I precisely execute direct response copywriting techniques to motivate readers to take the next step in the sales process so the copy generates revenue and leads. Does it convert every time? No. No copywriter is 100% effective. But I have a proven track record writing copy that beats controls and improves conversion. 2. I hit deadlines so you get your product or service to the market on schedule, keep clients happy, and generate revenue faster. Your copy will be safely in your email inbox at the deadline. 3. A partnership approach. I will make your life easier by solving problems and meshing my copy with the marketing strategy ... so the copy generates revenue and leads. Clients consider me part of their team. I am not the lowest priced copywriter but I'm not the most expensive. For one client, my fees represented .0023% of revenue generated. 4. TESTING—YES! I’m happy to test, then tweak headlines, offers, etc., to maximize your conversion. 5. SPEED—7 day turnaround available for 'emergency' projects. 6. Flexibility and sound business knowledge. I’ve written copy for everything from mortgage services to golf resorts and from pay per click software to home repair services. I can quickly understand the business model and put myself in the shoes of the customer so the copy produces results. B2B and B2C. 7. First-class service. I respond to emails and return calls quickly—providing fast turnaround if there’s an emergency. I keep your projects on track and you get a 'set and forget' copywriter you can trust. 8. I'm a student of direct response copywriting to help me improve my copywriting skills and improve your response. I've read the major books about direct marketing and copywriting plus I took (and paid for) copywriting instruction from Herschell Gordon Lewis. I regularly attend copywriting bootcamps and seminars and received instruction from Clayton Makepeace, Bob Bly, Dan Kennedy, and Drayton Bird. 9. I can help you charge significantly more, more often, for your products and services. My direct response copywriting will help you justify higher prices and fees so you generate more revenue and profit. 10. I get it right the first time to save you bandwidth. My copy rarely needs time-consuming revisions. You spend more time on critical tasks and less time on tedious revisions. The reason? My exclusive ‘preflight’ copy checklist. 11. None of this absurd hard to get "maybe I'll work for you if you're so lucky" copywriter snobbery and nonsense. I can't work with everyone ... obviously ... but I ALWAYS treat prospective (and current) clients with respect. — Founder, Marketing Company in Brisbane, Australia. For my portfolio, click here now. To read about me, go here. I'm also a Dan Kennedy Certified Copywriter for Info-Marketers. I mentored under Andrew Wood at Legendary Marketing. As a member of AWAI, I have taken their "Masters" program for copywriters. At the 2013 AWAI Copywriting Conference, my copy placed 3rd out of 48 entries in a "spec" challenge that Clayton Makepeace judged. I look forward to helping you generate leads and revenue. I welcome the opportunity to speak with you to discover more about your revenue goals and your current obstacles. I provide a free 60 minute initial consultation for serious direct marketers. I'm happy to provide ideas so you gain a sense of how you can improve conversion and generate more revenue. Call me at (704) 517-0241 or click here now to schedule a time to speak. I'm on Skype at ScottMartin22. P.S. Do you want to make sure you ‘cover all the bases’ with every direct marketing campaign? Click here now for my exclusive direct marketing checklist.